Another heated race under French sun at Paul Ricard brought a clear winning Ingo Gerstl (Top Speed, OPEN class) with a head-to-head competition following on position 2 and 3 between the youngsters Rinus van Kalmthout (Mansell Motorsport, OPEN class) and Johann Ledermair (Ledermair Motorsport, FORMULA class). Start of race 2 at Paul Ricard 2017. The gap between Gerstl and the closest rivals on track, Rinus van Kalmthout (+ 1:00,865 min) and Johann Ledermair (+ 1:10,978 min) on position 2 and 3, was significant. “There was no chance against Ingo (Gerstl) today”, van Kalmthout showed respect to the winner. The both youngsters, Rinus 16 years old, Johann 25 years old, showed a decent battle. At the end best lap times were more than close, with a 1:50,616 min by van Kalmthout in his GP2 Evo Dallara and a 1:50,643 by Ledermair in his Dallara GP2. Quita a remarkable performance by the Austrian Ledermair, if you notice, that he competes in the FORMULA class, while van Kalmthout starts at the OPEN class. “It was a good race, tyre management went well again”, van Kalmthout was satisfied with his race. “Ingo was really quick, I had no chance, keeping up with him. Finally we got out the most of what was possible today, so I’m happy with the result”, the Dutch was satisfied with reaching the P2 again. 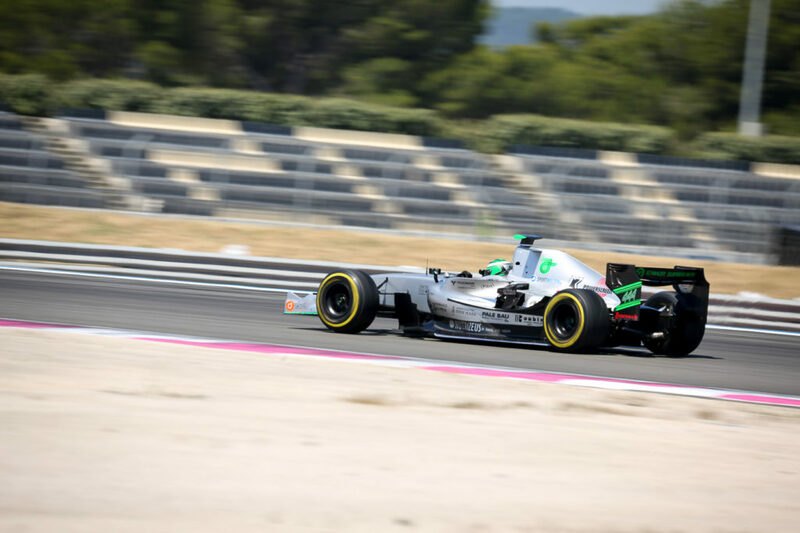 Johann Ledermair on track at Paul Ricard 2017. Meanwhile Johann Ledermair, finishing on grid position 3, making the P1 of the FORMULA class, was not pleased overall, but struggled with himself. “I’m totally not satisfied. The whole weekend was running a kind of weird. Initially I assumed tyre-problems due to their conditions after the race in Zandvoort. I was absolutely convinced, that the tyres caused some problems, we had to deal with. So we changed tyres, but I noticed immediately during the warm up lap, that something still is wrong. We checked everything and I got an okay by my chief mechanic. But I felt strong vibrations at the steering wheel during the race and took out some speed due to security reasons. Finally I just aimed to finish the race considering these circumstances. Most of all I’m angry with myself about hanging up on a tyre problem which turned out to be wrong”. Wolfgang Jaksch (l.) overtaking Mahaveer Raghunathan at Paul Ricard 2017. 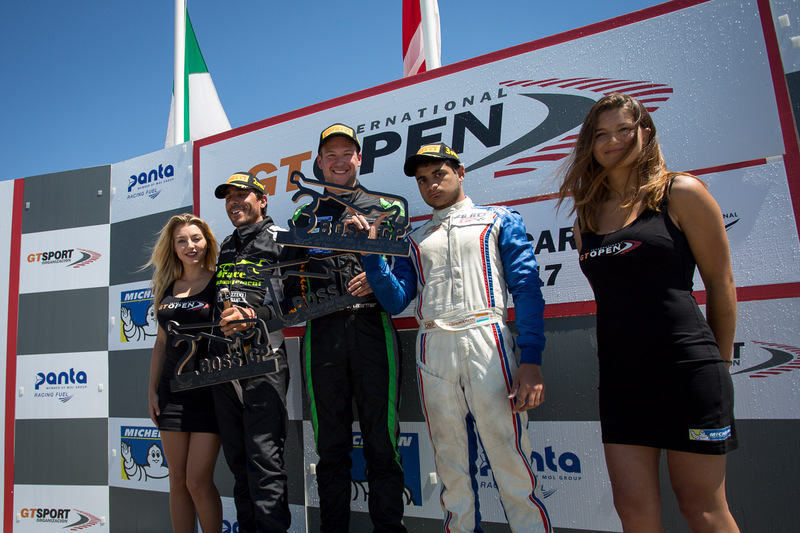 Salvatore De Plano (MM International Motorsport) and Mahaveer Raghunathan (PS Racing by Coloni Motorsport) rounded the podium of the FORMULA class off, finishing on position 5 and 6. Got overtaken by Jaksch couple of laps before the finish, the gap between best lap times of the Italian (1:56,651 min) and the Indian (1:56,625 min) nevertheless was tight. “I totally didn’t expect to make it to the podium, so I am really really happy”, De Plano smiled widely. 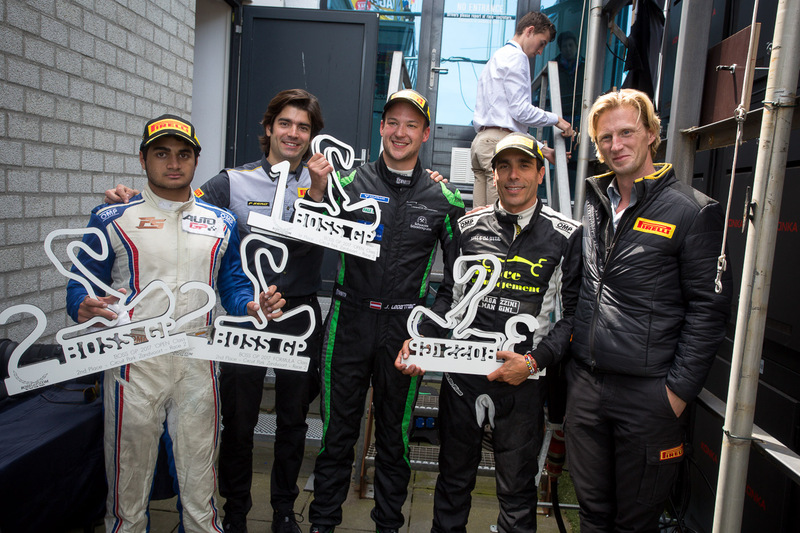 Having big issues on Saturdays race (“The car was terrible!”), De Plano changed his tyre management for Sundays race and was absolutely pleased: “The car run perfect, conditions were great, I loved the hot weather; it was a perfect race day for me.” Meanwhile P3 Mahaveer Raghunatan was happy, having reached a podium position as well, but struggled with the track layout. “The problem were the long straights. I lost a lot of time on these straights, actually I lost too much time there”, he summed up. The remaing grid (all FORMULA class) either performed best lap times close to the podium drivers. David Moretti (Griffith’s, FORMULA class), getting overtaken by even seven drivers in the early stage of the race, started a great fight and made it from position 13 in round 2 up to position 7 while crossing the finishing line (best lap: 1:56,900 min). Wolfgang Jordan (8., H&A Racing, 1:59,784), Henk de Boer (9., De Boer Manx, 1:59,115) and Armando Mangini (10., MM International Motorsport, 1:58,225) also performed their best lap under two minutes. Christian Eicke (11., Speed Center, 2:01,327), Martin Kindler (12., Jenzer Motorsport, 2:02,586) and Bruno Navarrete (13., Griffith’s, 2:03,357) were close by. 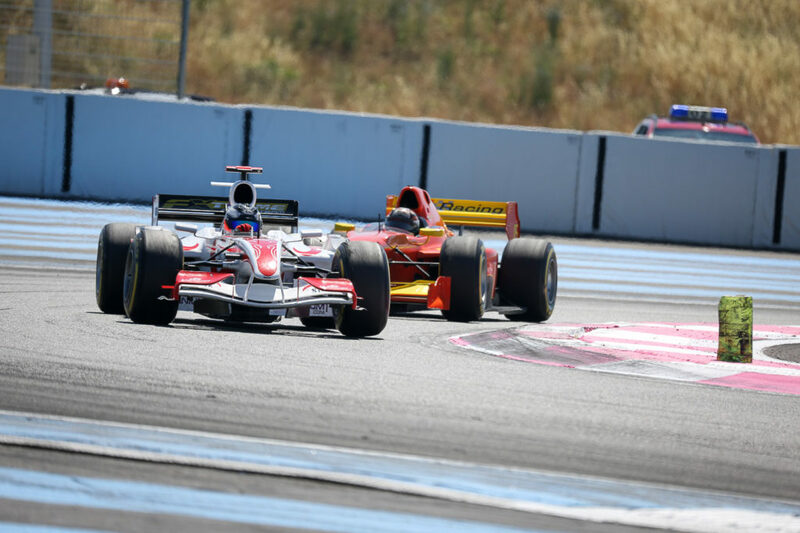 Race 2 at Paul Ricard 2017. 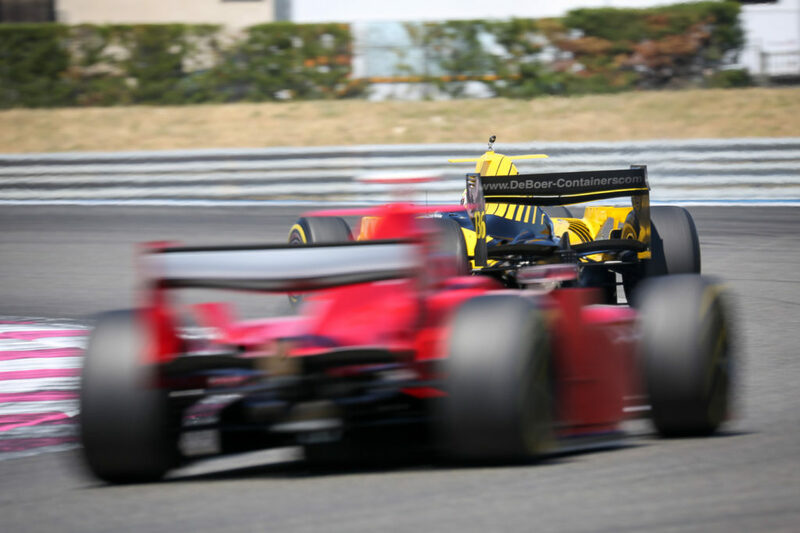 Four out of the starting grid of 17 cars were not classified because of early exits, due to various technical problems. While Florian Schnitzenbaumer (Top Speed, FORMULA class) had problems with the gearbox of his GP2 Dallara in lap 11, Veronika Cicha (H&A Racing, FORMULA class) had to exit the race due to tyre-problems as well in lap 11. Already in lap 5 Patrick D’Aubreby (Griffith’s, OPEN class) exited the race with technical problems. Peter Göllner (Speed Center, FORMULA class) spun off the track in lap 4. Results race 2 Paul Ricard 2017. Hunting the reigning champion and current leader of the OPEN class Ingo Gerstl (Top Speed), youngsters Rinus van Kalmthout (Mansell Motorsport, OPEN class) and Johann Ledermair (Ledermair Motorsport, FORMULA class) did a great job. At the end of race 1 on Circuit Paul Ricard in France the experienced driver made quite clear, that he wouldn’t let go his pole position of the grid. The race started – at boiling, southern French heat – with a crash of Peter Göllner (Speed Center, FORMULA class) in round 1. During overtaking, Göllner had trouble to keep his GP 2 Dallara on the lane and crashed. The following safety car phase challenged drivers and cars due to the danger of overheating and “really didn’t suit the plans”, winner Gerstl grumbled after the race. When the track was released for the grid, drivers took off and stepped on the gas. Gerstl as well as his hunters van Kalmthout and Ledermair, soon established the Top 3, who kept the following field on distance. “Of course I’m pleased by the win. With the expection of some details we had a great race”, Ingo Gerstl was happy about his win with a best lap time of 1:48,420 min. “The duel with Rinus (van Kalmthout) on position 2 was interesting. I wasn’t too sure about a direct, close battle with him on the track. It’s not yet too easy, to estimate his experience. I mean – he his just 16 years old. He showed a great performance and made it a really good race; guess how he will drive with a couple more years of experience. 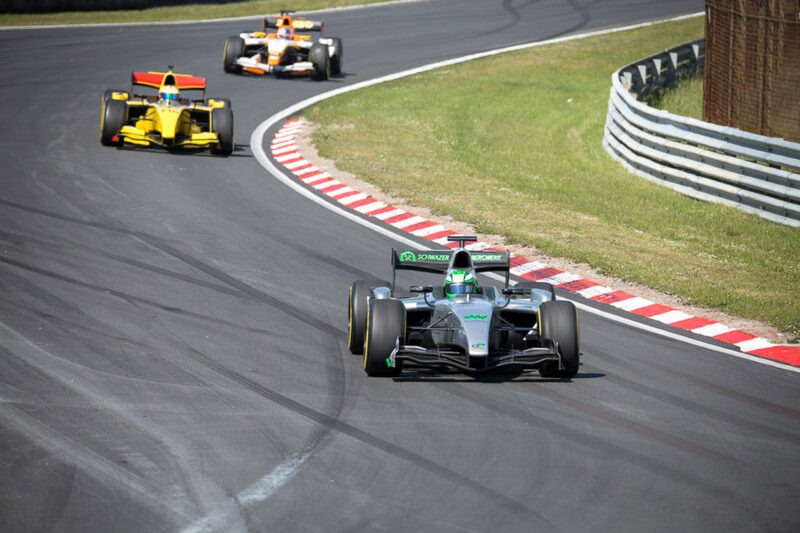 So actually we can look forward to further races with and against him”, Gerstl was pleased. Race 1 at Paul Ricard 2017: Leading Ingo Gerstl (r.) sharply followed by Rinus van Kalmthout. 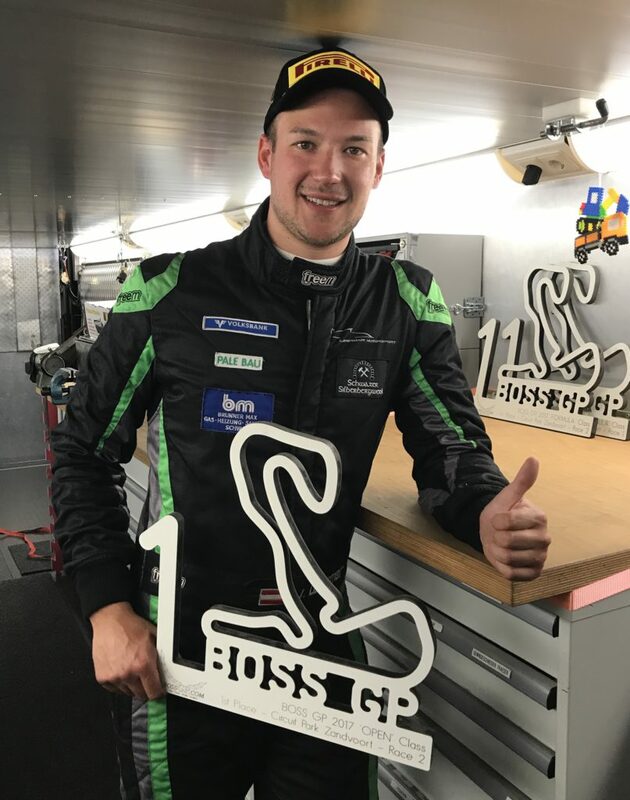 By Gerstl much praised, Rinus van Kalmthout himself was not only happy about making it to P2 with a best lap time of 1:50,847 min, but also with his personal fast growing learning curve: “It was a good race. First round was pretty close with Ingo (Gerstl), so I could stayed with him. Then we had the safety car phase; it was something to learn from – warming the tyres, warming the brakes. So that’s why actually I was happy about this experience. The race felt really good, even if driving between Ingo Gerstl with one second gap in front and Johann Ledermair with one second gap behind was just like a little bit driving alone. I learned a lot about tyre management during that race, since the driving with Pirelli is a totally new experience for me.” In particular the final stage of the race pleased van Kalmthout: “It’s nice to see that at last lap I was quicker than Ingo (Gerstl). That really gives me a confidence boost.” Goal of the 16 years old Dutch for race 2 at Paul Ricard on Sunday? : “Getting closer to Ingo (Gerstl)”. So quite a nice challenge waits for van Kalmthout, since Gerstls target for Sundays race is “to drive some really fast laps at the second race, after being five seconds slowler at race 1 than at Qualifying”. Ingo Gerstl (l.) and Rinus van Kalmthout (r.) talk-shopping after the race. The podium of the OPEN class was completed by Wolfgang Jaksch, who raced onto overall position 7 with his Super Aguri SA06 (best lap: 1:58,177 min). “Second race this season, second podium. I’m absolutely happy about this result”, Jaksch smiled widely after the podium ceremony. Especially, since “it was a really difficult race. The grip level was totally different from the grid level during Qualifying. So the car was quite unstable and it was hard work, to bring my car home and take it to the finish. Lap times could have been better; despite of course I’m very happy with the P3, but not, how the race went.” Jaksch was self-critical as well: “I have to work on myself, to get along better with such difficult race conditions.” For second race on sunday “we will work on the setup and will do some finetuning. Making it again to the podium would be great”. Jaksch sets position 4 of the overall OPEN class ranking with 40 points, behind Ingo Gerstl on position 1 (75 points), Rinus van Kalmthout (47) and Phil Stratford (44). 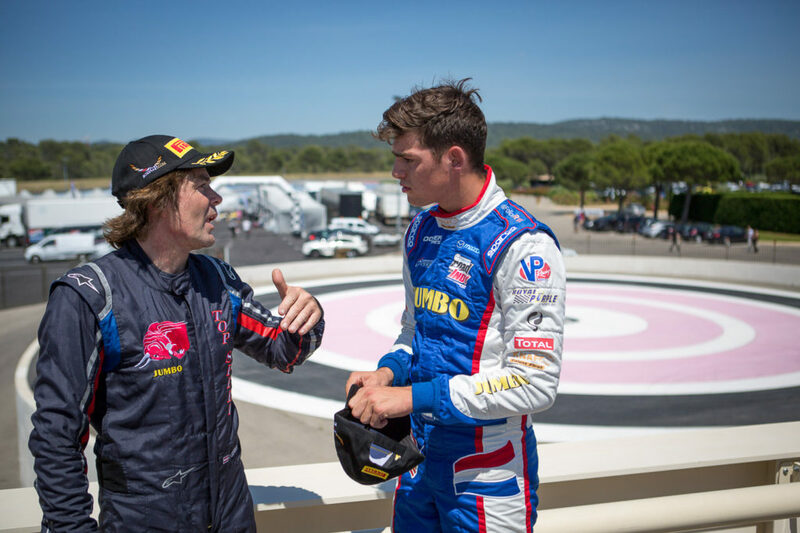 A great catch up on the track of Paul Ricard showed David Moretti (Griffith’s). Starting from position 10 at his first BOSS GP race at season 2017, he made it to position 6, overtaking couple of drivers with his GP 2 Dallara. Definitely less satisfied was Veroninka Cicha (H&A Racing). After a great performance at Qualifying in the morning, her car showed technical problems sharply before finishing the race, during lap 9. After recurring technical problems, as well during practice as at Qualifying, Karl-Heinz Becker retired from the race already after dropping out of the Qualifying, just racing one single round. 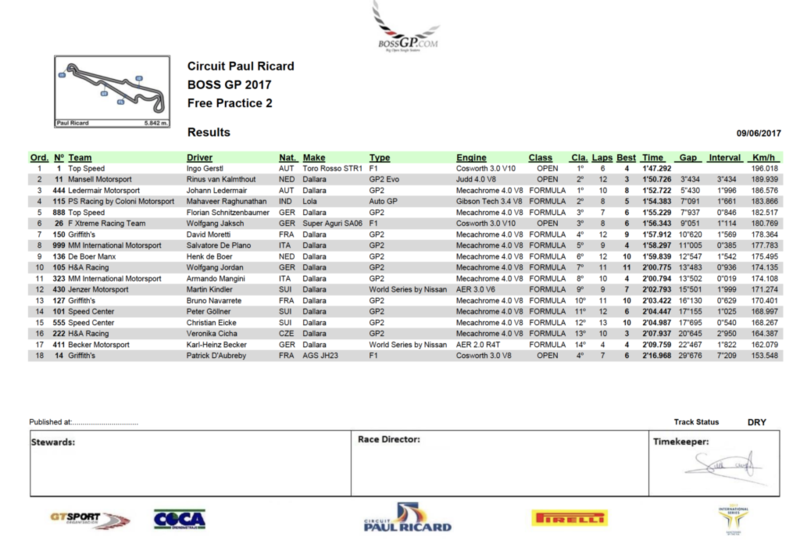 Results race 1 at Paul Ricard 2017. 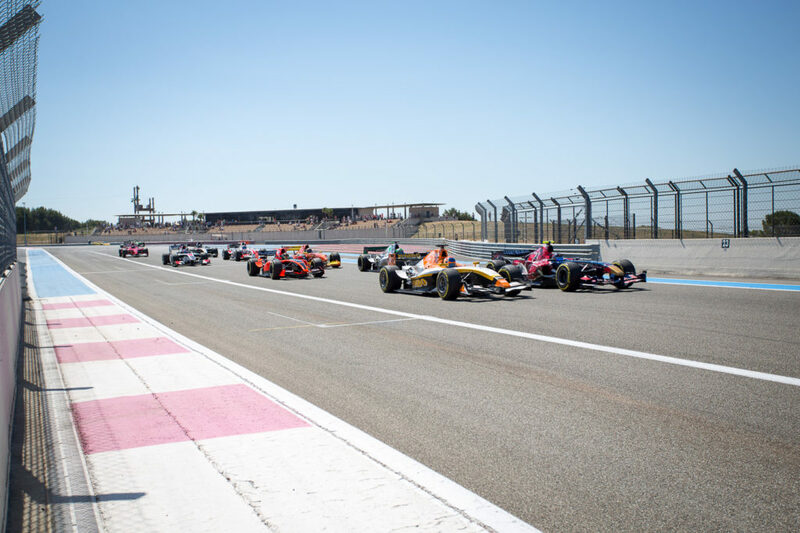 While Le Castellet and its Circuit Paul Ricard continously are heating up, BOSS GP teams went on track for Qualifying at Saturday morning at temperatures of about 27°. Under best conditions Qualifying brought some “strange failures”, as Harald Michel, Official Scrutineer of BOSS GP Championship, recapped the session. At first the Top 8 drivers of Fridays practice day – Ingo Gerstl (Top Speed), Rinus van Kalmthout (Mansell Motorsport), Johann Ledermair (Ledermair Motorsport), Mahaveer Raghunathan (PS Racing by Coloni Motorsport), Florian Schnitzenbaumer (Top Speed), Wolfgang Jaksch (F Xtreme Racing Team), David Moretti (Griffith’s) and Salvatore De Plano (MM International Motorsport) – entered the 5.842 km long track. Wolfgang Jaksch during Qualifying at Paul Ricard 2017. Two drivers left the Qualifying unplanned. While Wolfgang Jaksch with his Super Aguri SA06 failed due to a major driving error already early, Johan Ledermair in his GP 2 Dallara was stopped by a technical problem. “The car had an fatigue fracture”, Ledermair wasn’t pleased by his unexpected exit, “our team will work out on that. We hopefully will fix the problem until the race on the afternoon”. Nevertheless – with a 1:49.560 min he raced onto start position 3 for the race this afternoon before he had to exit. No technical problem, but a “clear driving error I made”, stopped Wolfgang Jaksch already in round 3. “I was delayed by Moretti in the first round. So I really had to push hard the following round, to improve my time. I managed to overtake him, but misjugded my braking phase afterwards; so I missed to take the turn properly and got stucked in the gravel trap”, Jaksch summed his performance up. “Luckily I made at least one counted lap”, he adds, starting with a 1:54.722 min lap-time on start position 6. The two exits slowed down leading Ingo Gerstl, who raced onto pole position nevertheless. “If everything runs smoothly, I improve my time each round. So for the Qualifying I targeted a 1:40′ lap-time. Unfortunately we had to slow down twice during the Qualifying, which only gives us 8 minutes, to race a best time”, Gerstl summarized the Qualifying. “Of course I’m fine with starting from pole-position. But actually there could have been potential for a much better time on the track”, the current leader of the OPEN class made his point. He now is “looking forward to great race and especially the duel with Rinus van Kalmthout”. 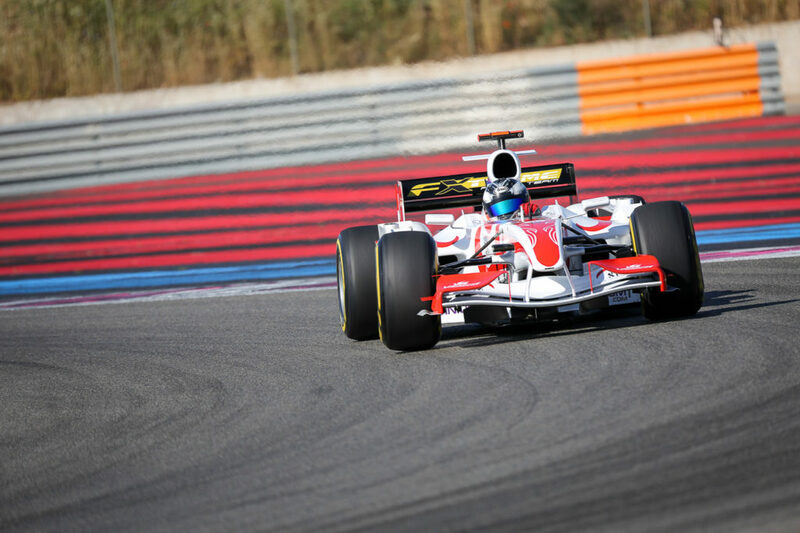 The 16 years old Dutch raced onto position 2 in his GP2 Evo Dallara. Qualifying results Paul Ricard 2017. Armando Mangini during Qualifying at Paul Ricard 2017. Started in the second chapter of the Qualifying, Armando Mangini (MM International Motorsport) with his GP 2 Dallara managed to improved time and position into to Top 8 field and moved forward in the starting grid; he will now start from position 8 in the afternoon. The starting grid for season race 5 is set, and will be led by the “usual suspects”. The setup of Ingo Gerstl holding the pole position, followed by Rinus van Kalmthout on position 2, Johann Ledermair on third position promises an exciting top of the field. Kick-off of the race is at 2:30 p.m. See and follow BOSS GPs Instagram channel for live updates and coverage. 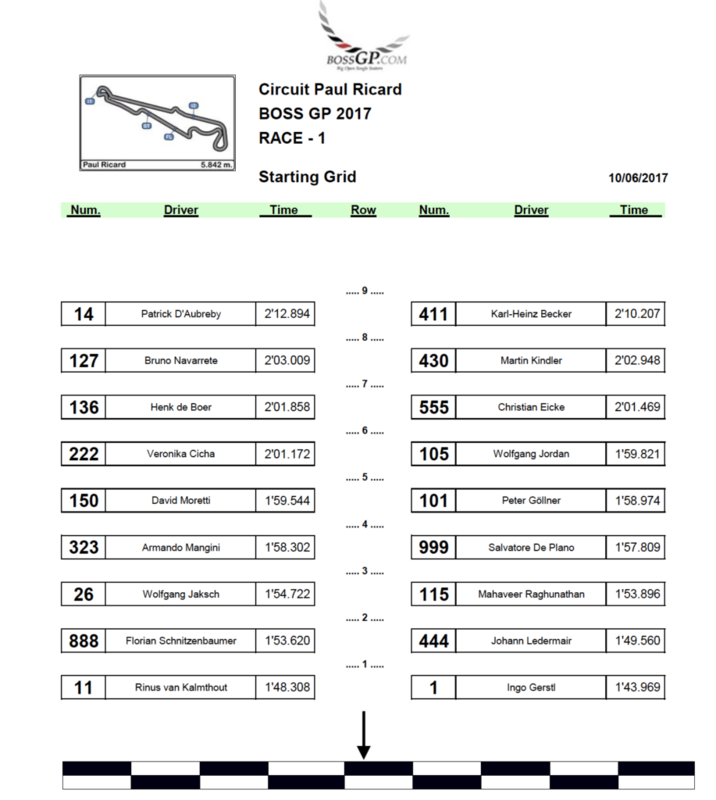 Starting grid season race 5 at Paul Ricard 2017. 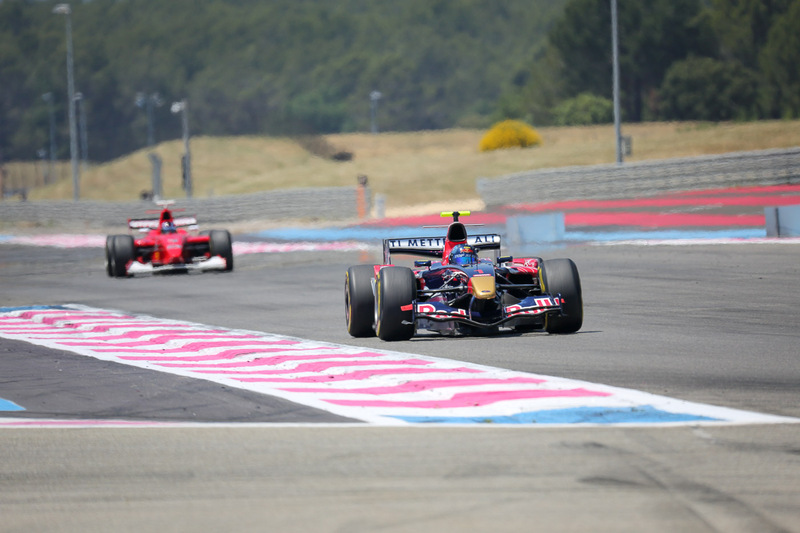 Blue sky and 25° – Le Castellet obviously wants the best for BOSS GP. Fitting to great weather in southern France, the BOSS GP teams had an practice day, which mostly run according to the plan. “Both training sessions went well with the exception of some technical problems of the Dallara from Karl-Heinz Becker”, race-coordinator Christian Gänse was satisfied with the performance on practice day. Fastest drivers on track – the “usual suspects”. First practice session was led by Ingo Gerstl (Top Speed) in his Toro Rosso STR1 (OPEN class) with a best lap-time of 1:48.490 min on the 5.842 km long track. He was followed by teammate Florian Schnitzenbaumer (Top Speed), who got a best lap-time of 1:56.394 min in his Dallara (FORMULA class). Mahaveer Raghunathan (PS Racing by Coloni Motorsport) in his Lola (FORMULA class) sharply behind (1:57.001 min) and Johann Ledermair (Ledermair Motorsport) in his Dallara (FORMULA class) as well sharply behind (1:58.614 min) also remained under the two-minutes-mark. 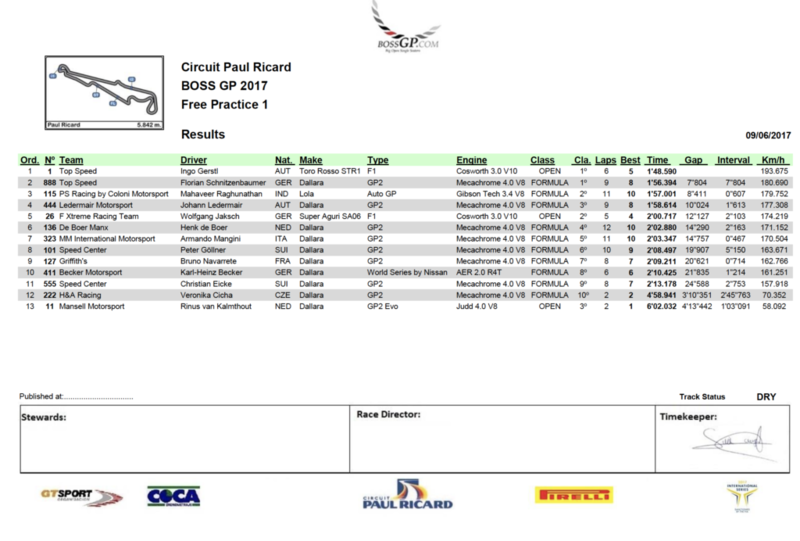 Results first practice session Paul Ricard 2017. Best conditions on the track as well at the second practice of the day on early afternoon. While the grid was lead again by Ingo Gerstl, who improved his best lap up to 1:47.292 min, Rinus van Kalmthout (Mansell Motorsport, OPEN class) sneaked up and showed his best lap in 1:50.726 min, which made him the second best ranked driver of the session. Johann Ledermair, current leader of the FORMULA class overall ranking, improved his best lap significantly as well with 1:52.722 min and made it into the “Top 3” of the second practice session. With Mahaveer Raghunathan (1:54.383 min), Florian Schnitzenbaumer (1:55.229 min), Wolfgang Jaksch (F Xtreme Racing Team, OPEN class, 1:56.343 min), David Moretti (Griffith’s, FORMULA class, 1:57.912 min), Salvatore De Plano (MM International Motorsport, FORMULA class, 1:58.297 min) and Henk de Boer (De Boer Manx, FORMULA class, 1:59.297 min) nine drivers made it to a < 2 minutes lap. 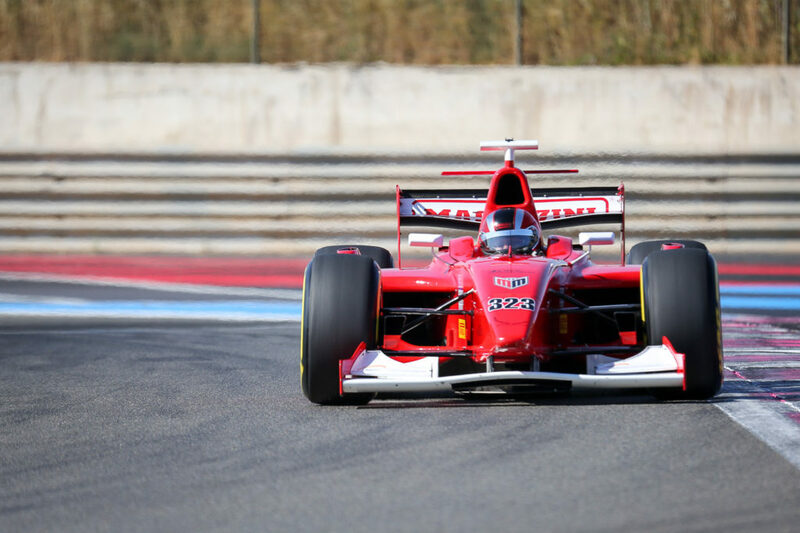 A promising kick-off for a fast race weekend in Le Castellet. Results second practice session Paul Ricard 2017. 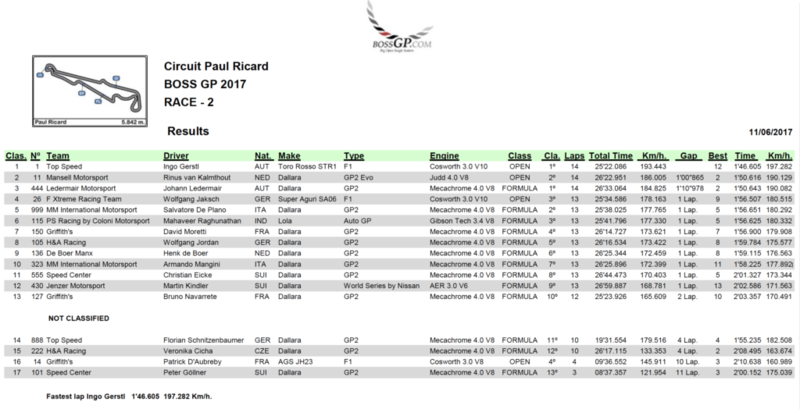 Detailed results I: Results first practice session Paul Ricard 2017. Detailed results II: Results second practice session Paul Ricard 2017. Third station of the BOSS GP Championship season 2017 this weekend (10.-11./06.2017) is around the corner. The start list for the races in France is now set. 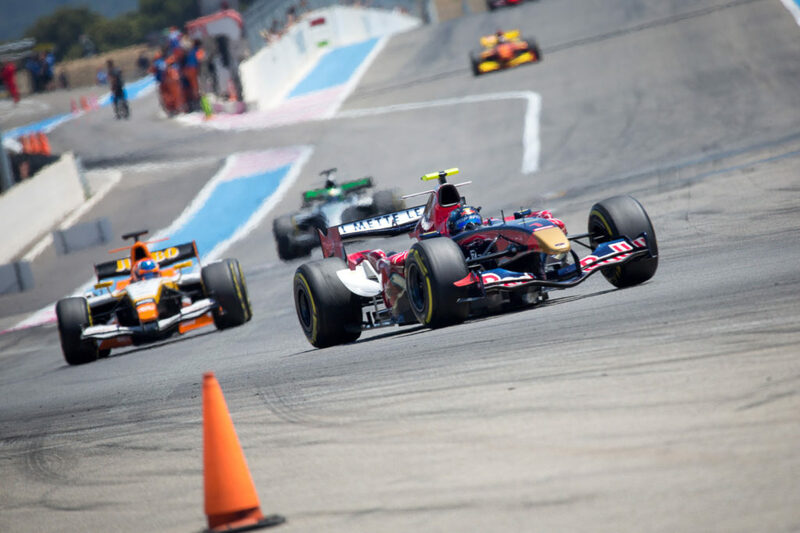 Host for season races 5 and 6 is the “GT Open & Euroformula Open” at the French Circuit “Paul Ricard” in Le Castellet. Last time, BOSS GP teams were racing at this track, was at the “FFSA Historic Tour” in May 2015. So drivers and crews will be back on the track, which will host a “Grand Prix of France” at the Formula 1 in 2018, ten years after the last F1-race in France was held. 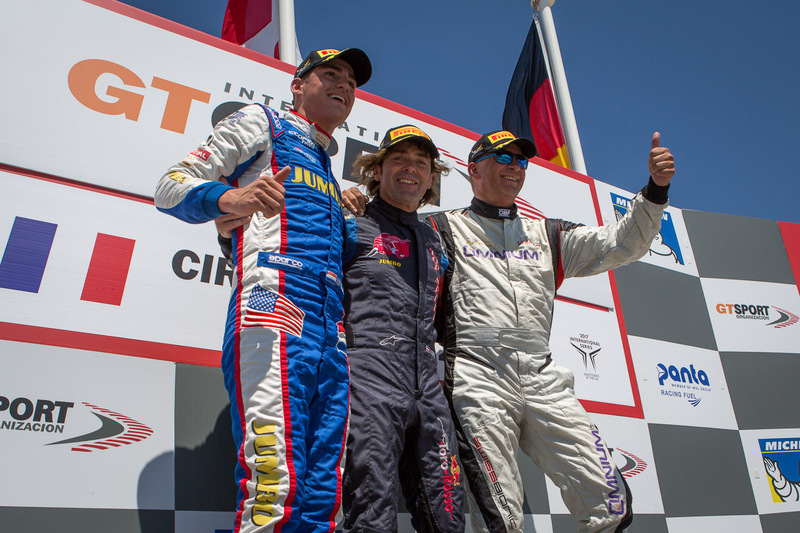 Reigning Champion and current leader of the OPEN class, Ingo Gerstl (Top Speed), will be back on track in Le Castellet as well as Wolfgang Jaksch (F Xtreme Racing Team), who didn’t race in Zandvoort either. Also Rinus van Kalmtouth (Mansell Motorsport), who made his BOSS GP debut in Zandvoort three weeks ago, will start at Paul Ricard. The French Patrick D’Aubreby (Griffith’s) will run his first race of the BOSS GP championship 2017 on his “home track”. BOSS GP will compete at seven different European venues in 2017, holding 14 races in total. Hockenheim in April and Zandvoort in May are done. Paul Picard (FRA) will set season races 5 and 6. Remaining tracks are Zolder (BEL), Assen (NED), Brno (CZE) and Imola (ITA). 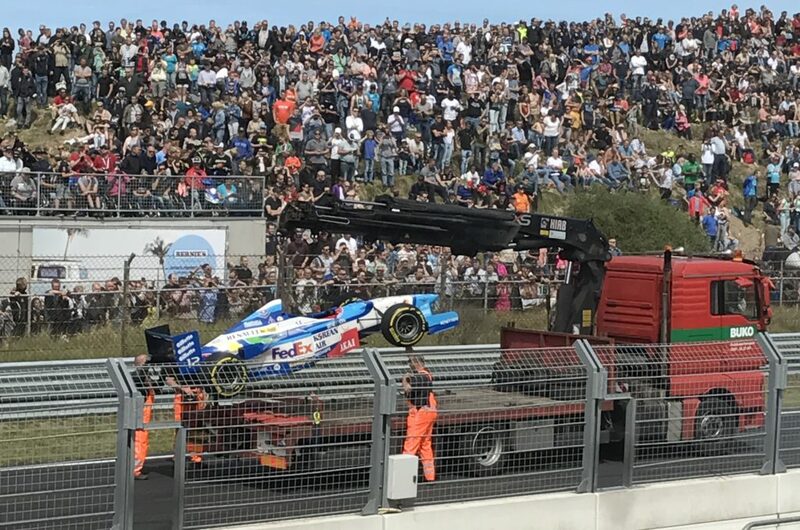 After a thrilling race on Saturday at the “Jumbo Race Festival” in Zandvoort race 4 of the BOSS GP season 2017 on Sunday had some surprises too. The podium of the FORMULA class however after 14 laps was the same as the day before, Johann Ledermair (Ledermair Motorsport) clearly dominating the grid, followed by Mahaveer Raghunathan (Coloni Motorsport) and Salvatore de Plano (MM International Motorsport). Unfortunately both drivers of the OPEN class, Marijn and Rinus van Kalmthout (both Mansell Motorsport) dropped out of the race early due to a crash and technical reasons. 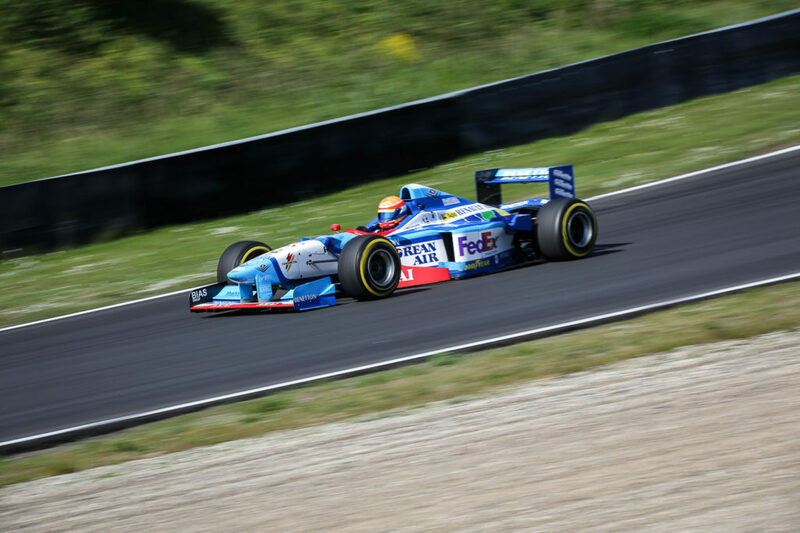 While Johann Ledermair could defend his pole position in his Dallara GP2 into the first curve, the “Tarzanbocht”, against attacking Rinus van Kalmthout in a Dallara GP2 Evo, who had started from position 2, Marijn van Kalmthout had huge trouble. After his Benetton B197 F1 got hit Kalmthout lost one of his tyres at the start straight, what meant a much to early out for the local hero. Couple of laps under yellow flag and safety car phase were following for the grid, drivers even had to pass the pit lane again, since the straight lane was blocked by rescue operation for Kalmthouts Benetton. “It was not too easy, to avoid overheating of the engines and keeping the tyres on the neccessary temperatures”, Johann Ledermair explained the difficult conditions at the first phase of the race. Already during the safety car phase Rinus van Kalmthouth, the only left driver of the OPEN class in the grid, had to turn back to the box too, due to technical problems with his Dallara GP2 Evo. So season race 4 turned out to an exclusively FORMULA class race. Crashing on the start straight line directly after the start Marijn van Kalmthout unfortunately dropped out of the race early. When the safety car had left and the track finally was open for pure racing again, the “usual suspects” were competing for the podium. Ledermair kept the lead and grabbed P1, driving his best lap time in round 5 with 1:25.591 min. The Austrian was closely followed by Mahaveer Raghunathan, who showed his best lap time in round 10 with 1:27.675 min. The 18 years old Indian was happy with his performance and P2, despite he looked ahead to the next races (Paul Ricard Circuit/France, 10-11/06/2017) directly after the award ceremony. “The start of todays race was not that easy, but everything worked out well. Finally it was a tough race again, but I did my best. The goal was, to increase speed and improve the lap record from yesterdays race. That worked out well, so finally I’m happy with the performance this week and my overall results”, Raghunathan explained. 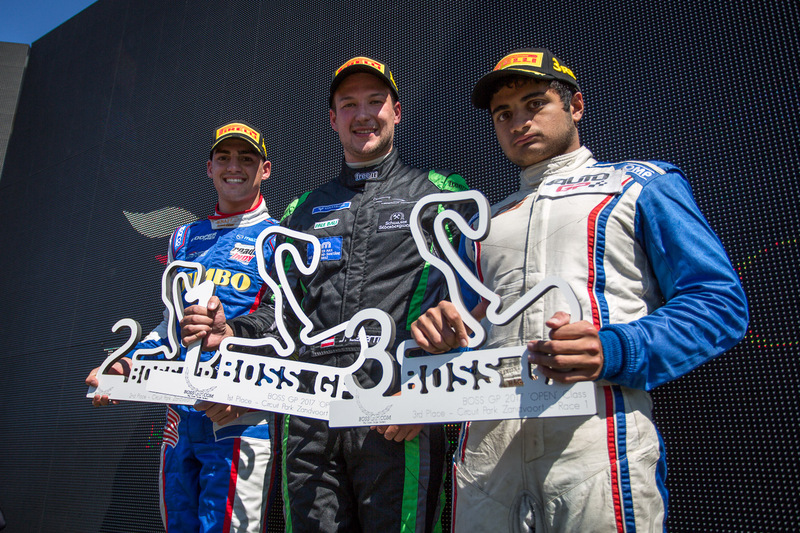 With a huge smile on his face Salvatore de Plano (MM International Motorsport) climbed onto the podium. After P3 on saturday he defended this position at race 2 and stressed out his great performance this weekend. “The track was a huge challenge to go for. I have never raced in Zandvoort before, so my focus on the track and its characteristics was immense”, de Plano told us after the race and started to rave about the track. “It is amazing, but you have to now the track very well, to have a good race. So I’m really happy with my result this weekend, since I could make it twice onto the podium and didn’t loose to many points in the championship. 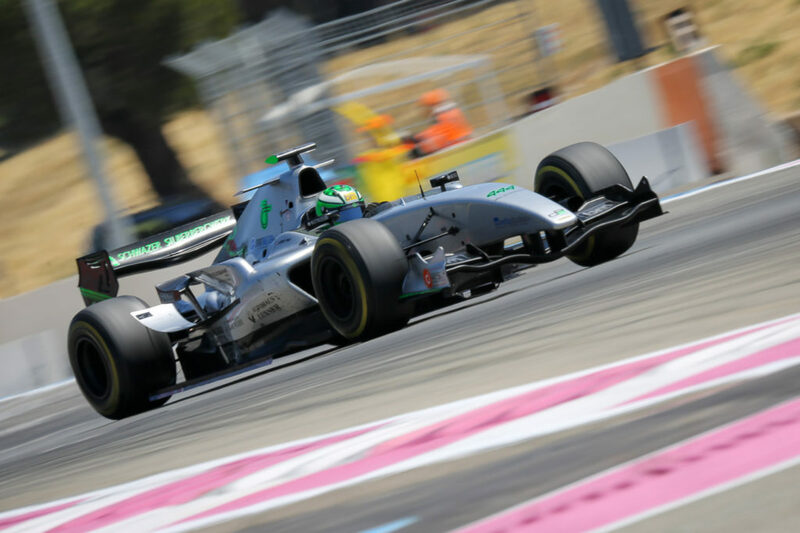 The car was perfect and I reached my personal goal, to come as close as possible to position 2.” As Raghunathan also de Plano wants to confirm his good shape on the track in Le Castellet at Paul Ricard in June. 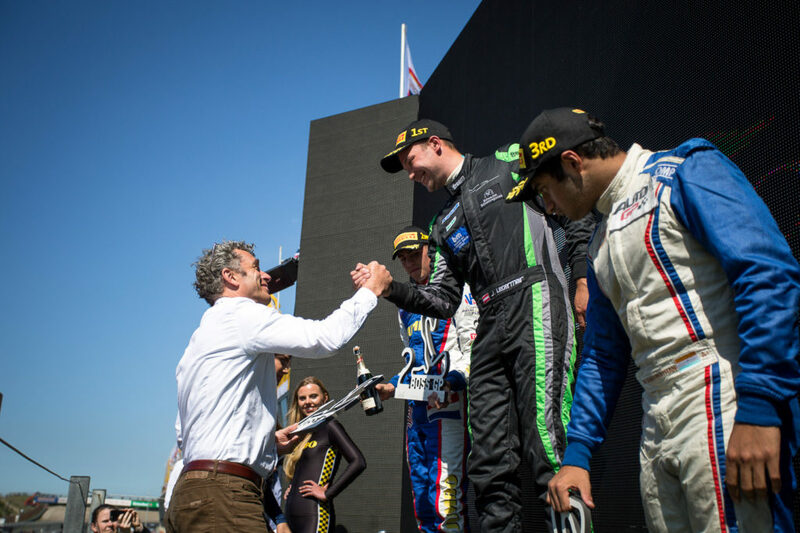 Champagne in Zandvoort 2017 after season race 4. The podium was followed by Marc Fagionatto (Zig-Zag) on position 4, Florian Schnitzenbaumer (5., Top Speed), Henk de Boer (6., De Boer Manx), Peter Göllner (7., Speed Center), Christian Eicke (8., Speed Center), PETER (9., Easy Formula) and Karl-Heinz Becker (10., Becker Motorsport). Becker just finished eleven laps, having technical issues in his last lap which forced him to finish the race. “We don’t know yet, what caused the problems. We have to analyse this issue”, Becker told after the race. 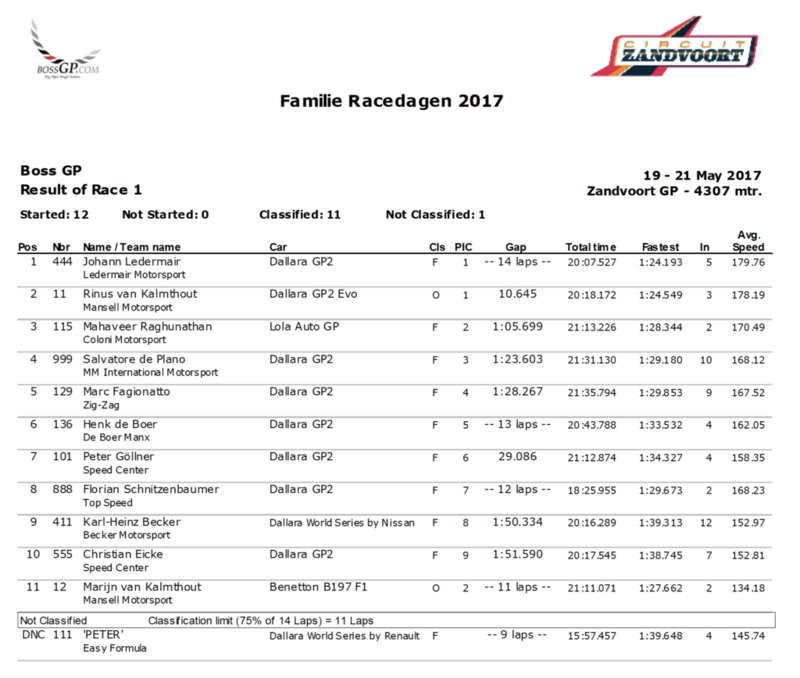 The results of season race 4 in Zandvoort 2017. Meanwhile winning Ledermair was satisfied with his progess during the race: “After an challenging start I was able, to control the race and bring it home safely. There were some factors, I had to pay my attention especially during the safety car phase, but everything worked out well. So at the end, I’m very happy with that clear win.” Besides and optimum of a race weekend Ledermair and his team take some “homework” back to Austria, they will work on until the next race. “We collected lots of data this weekend, we have to analyze. Of course we wont sit back now, but continue our work and make any effort, to increase the speed further on”, the ambitious youngster is looking into the future. Happy winner of race 3 and 4 at the race weekend in Zandvoort 2017. Next station for the BOSS GP championship 2017 is set already in three weeks. 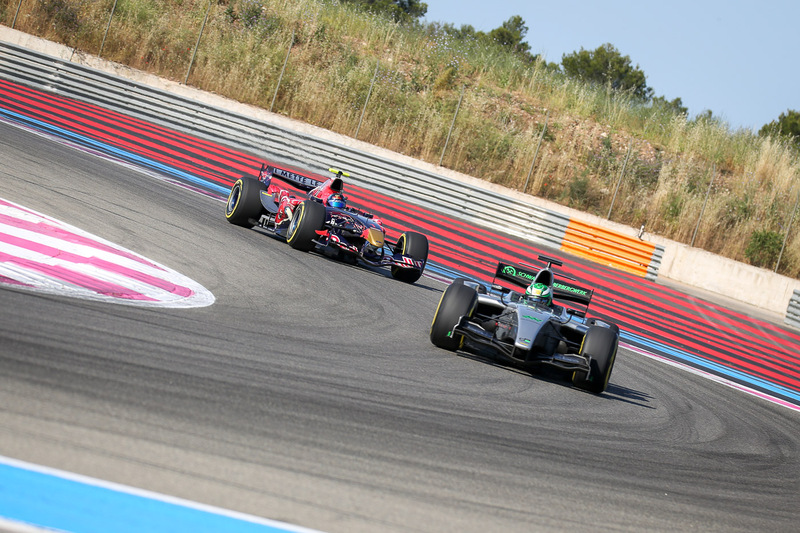 Circuit Paul Ricard in France, Le Castellet, will be the host with its “GT OPEN & EUROFORMULA OPEN”. 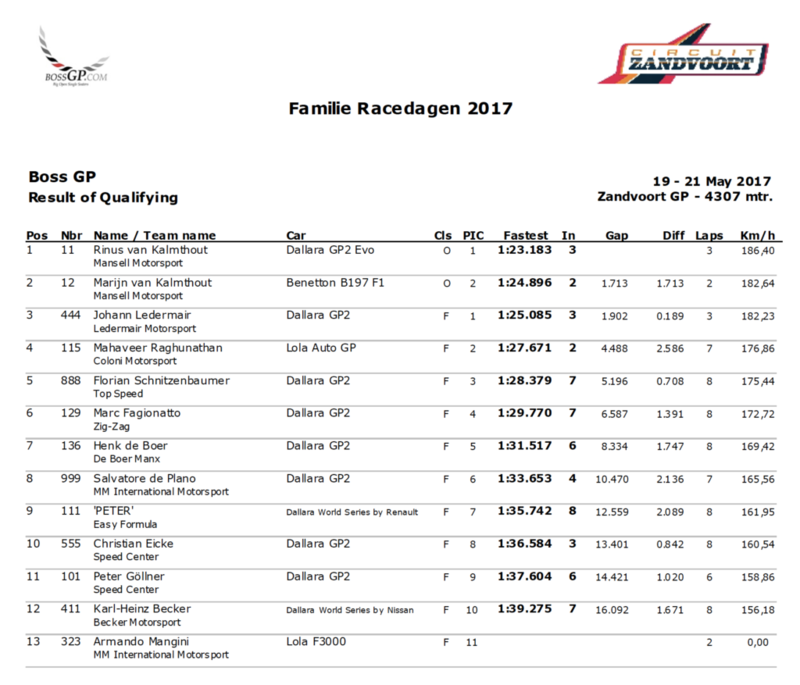 Detailed statistics of practices and qualifying: Results race 1 Zandvoort 2017. Thinking, a super-fast qualifying was a blast today, one has to find a new superlative for the sensation, that happened at the first race of the “Jumbo Race Festival” in Zandvoort on Saturday afternoon. Austrian youngster Johann Ledermair (Ledermair Motorsport) was not only dominating the FORMULA class clearly, but also beat local hero Rinus van Kalmthout (Mansell Motorsport) of the OPEN class. 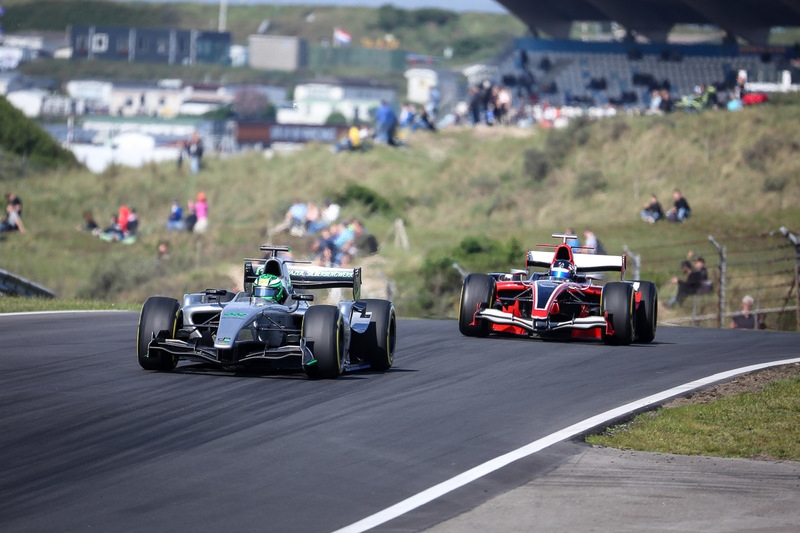 Hoping for an exciting first race at the “Jumbo Race Festival” in Zandvoort expectations were fulfilled, when Johann Ledermair of the FORMULA class in his Dallara GP2 beat Rinus van Kalmthout of the OPEN class in the Dallara GP1 Evo. While Ledermair set the lap record at 1:24.193 min, Rinus van Kalmthout finished his best lap in 1:24.549 min. Both youngsters enjoyed a clear lead of the grid, topped by a spectacular overtaking of Johann Ledermair in round 10, leading the grid for the last five laps on and bringing P1 home. Johann Ledermair taking the P1 of season race 3 in Zandvoort 2017. So P2 was owned by the youngest driver of the grid, BOSS GP-newcomer Rinus von Kalmthout. Starting from the pole positing and showing the thrilling fight with Johann Ledermair the 16 years old Dutch finished with the overall P2, owning the P1 of the OPEN class. P2 of the FORMULA class, Mahaveer Raghunathan (Coloni Motorsport), was fine with his podium position so far and a lap record of 1:28.344 min, but not 100% happy: “I could have gone for a better result, if I wouldn’t have been blocked by another driver”, 18 years old Raghunathan was not that satisfied. “I will go for this tomorrow and improve at the race on Sunday”, the P2 from India is more than motivated for season race 4. Happy with the P3 of the FORMULA class and his first podium position of the season was Salvatore de Plano (MM International Motorsport) with his fastest lap in 1:29.180 min, followed by BOSS GP returnee Marc Fagionatto (Zig Zag) in 1:29.853 min. Henk de Boer (5., De Boer Manx), Peter Göllner (6., Speed Center), Florian Schnitzenbaumer (7., Top Speed), Karl-Heinz Becker (8., Becker Motorsport) and Christian Eicke (9., Speed Center) completed the ranking. ‘PETER’ couldn’t be classified with a raced amount of just 9 laps, whereas 11 laps would have been necessary for a classification (75% of laps driven by the P1 (i.e. 14)). On the track in Zandvoort 2017. Meanwhile the OPEN class provided a really clear arrangement: Rinus van Kalmthout on the P1 was just followed by his father, Marijn van Kalmthout (Mansell Motorsport). The experienced driver suffered problems with a tyre in round 5 and was forced to a pit stop. He finished the race with a total of 11 laps on the 11th position, nevertheless ranked in P2 of the OPEN class, since there were registered only two starters in the OPEN class at all in Zandvoort. 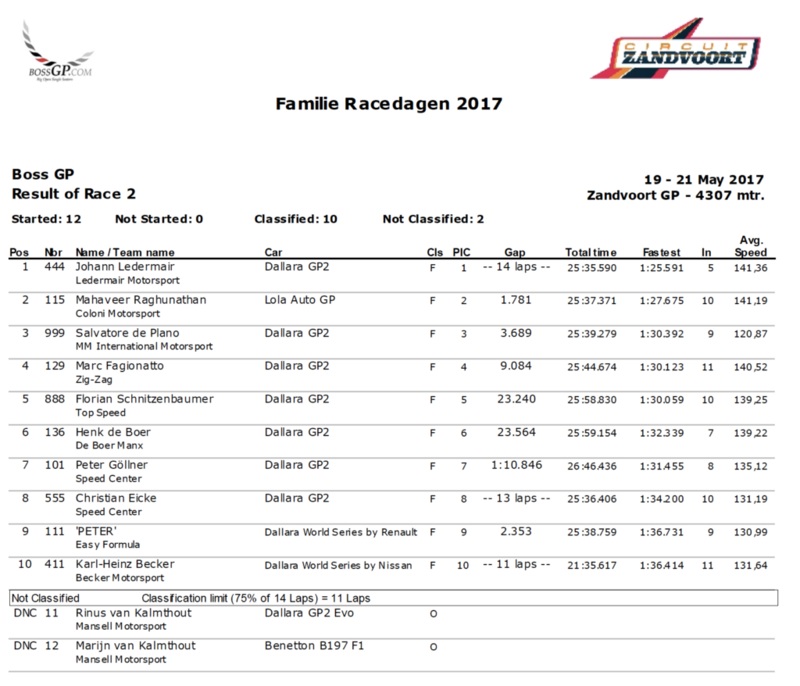 Results of race 1 in Zandvoort 2017. 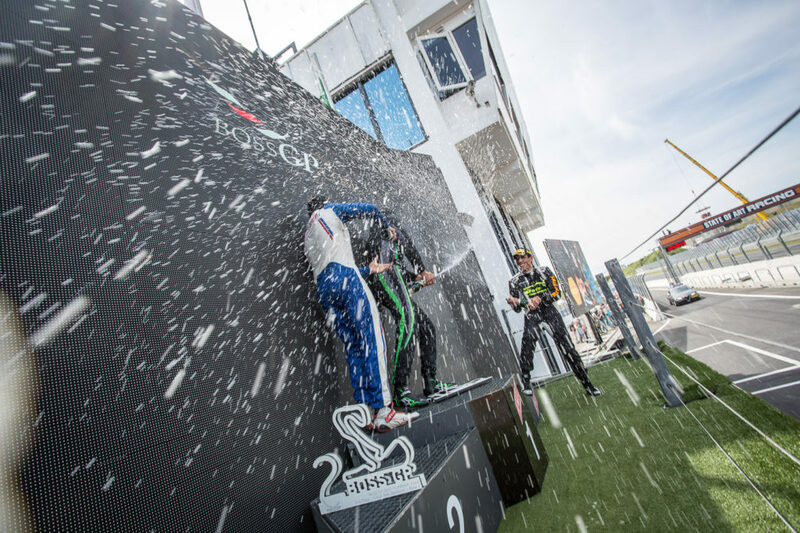 So, after an exciting first race day P1, Johann Ledermair, made a final statement about the key to success for winning the overall ranking at season race 3. “Winning today was also the result of an intensive practice-day on Friday and a lot of work after he second practice”, Ledermair explains. “My team did an incredible great job and put a lot of effort into the car until late into the night. Without them I couldn’t have done the race so well. We completely changed the setup of the car, after having quite a lot of problems during the first practice sessions. We made great progress at the second practice in the afternoon and after still some more changes for the race day we could progress once more for the Qualifying as well as the race.” Ledermairs coach, Oliver Saringer, was as well proud as thrilled about the performance of his Youngster: “It is a fact, that we won the OPEN class with a FORMULA car. That has never happened before”, he made the point. The podium of the race means starting from pole position for Johann Ledermair in Sundays race. After the thrilling first race in Zandvoort, spectators and fans can look forward to another exciting battle between Ledermair and Rinus van Kalmthout again on Sunday, when the Dutch youngster will start from position 2. 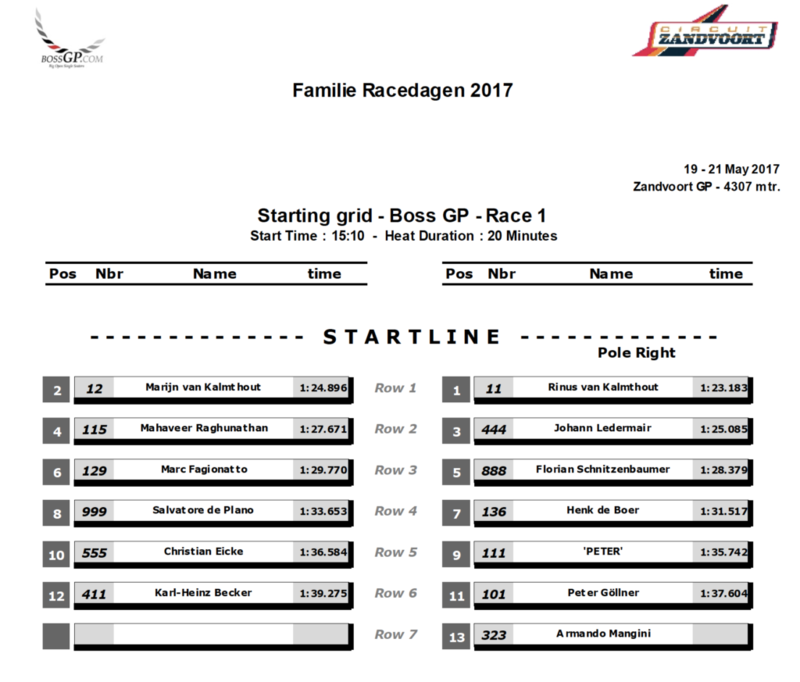 Startgrid of second race in Zandvoort 2017. Follow our live coverage from the whole event with pictures and video-impressions on our Instagram (bossgp2010) as well as Snapchat (bossgp2010) accounts. What a blast! 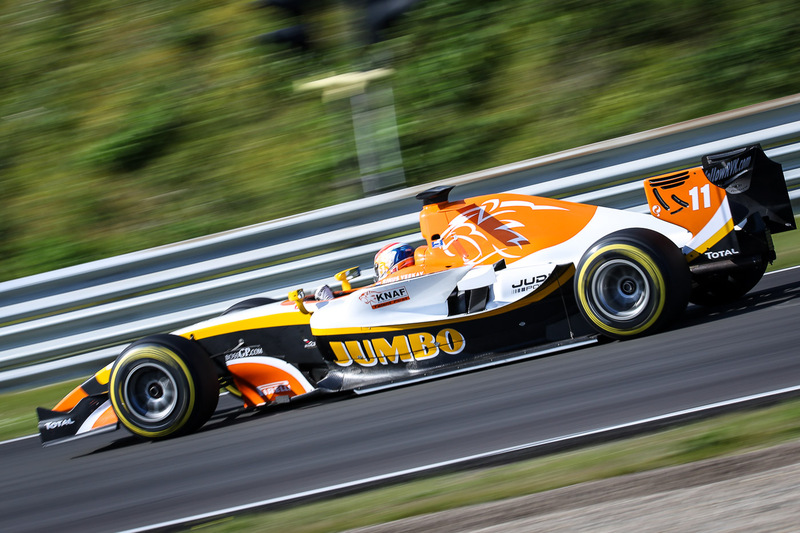 Rinus and Marijn van Kalmthout (both Mansell Motorsport) dominate the Qualifying at the “Jumbo Race Festival” in Zandvoort in front of tens of thousands of spectators. Even a drift off the track can stop Marijn van Kalmthout from securing a great position at the starting grid for the first race of the weekend this afternoon. 16 years old Rinus van Kalmthout started fast and got the blast in his third, at the same time last, lap at Qualifying and raced with a best time of 1:23.183 min on pole position for season race 3. His father Marijn van Kalmthout even just got two rounds on the track in Zandvoort, to secure position 2 at the grid for the race on the afternoon with a 1:24.896 min in round 2. After drifting of the track in the third lap, he didn’t return on the track. Both van Kalmthouts go for the OPEN class, racing with a Dallara GP2 Evo (Rinus) and a Benetton B197 F1 (Marijn). FORMULA class was lead by Johann Ledermair (Ledermair Motorsport) in his Dallara GP2 once more. With a best lap time of 1:25.085 min he will start from position 3, followed by Mahaveer Raghunathan (Coloni Motorsport), who drove a 1:27.671 min best time with his Lola Auto GP. Raghunathan dropped off the track during the last minutes of Qualifying, what finished the qualifying couple of minutes earlier than the scheduled time of overall 30 minutes for the whole grid. Marijan van Kalmthout on the track in Zandvoort 2017. After crashing at the second free practice on Friday afternoon Florian Schnitzenbaumers Top Speed team did a great job, fixing his Dallara GP2 until the Qualifying. The German did well and secured position 5 for the race this afternoon with a best of 1:28.379 min. See the detailed Qualifying results at the attached PDF-file below. Overall the Qualifying led to an exciting starting grid for the first BOSS GP race of the weekend at the “Jumbo Race Festival”. Since there are no complaints about the weather with blue sky, full of sun, just a little wind and a great atmosphere by an enthusiastic crowd at the grandstands BOSS GP is looking forward to a great race. Start is scheduled for 3:10 p.m. in the afternoon. 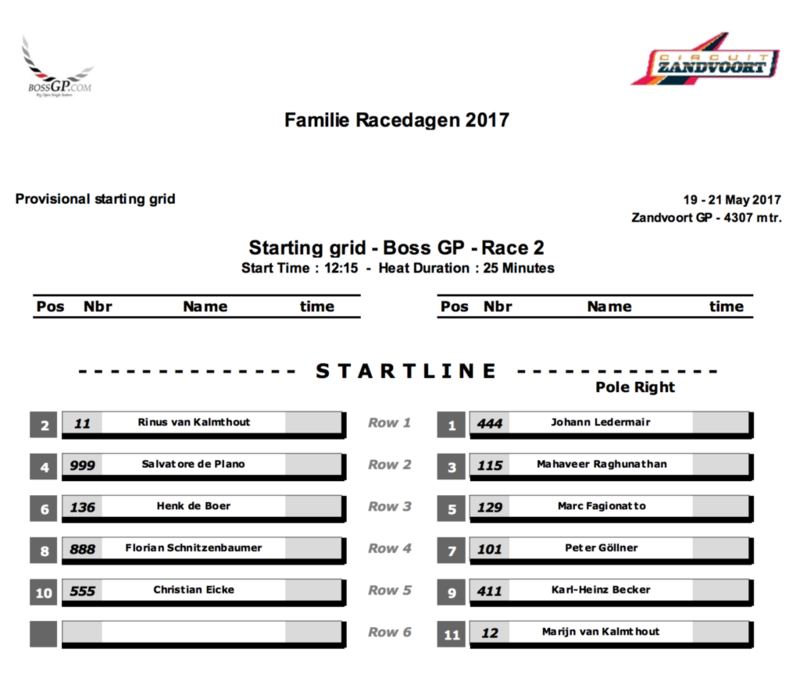 Starting grid first race in Zandvoort 2017, season race no. 3. Detailed statistics of practices and qualifying: Practice and qualifying results Zandvoort 2017.